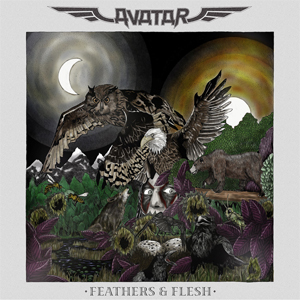 AVATAR have announced a brand new concept album titled Feathers & Flesh to be released on Friday, May 13, 2016 via Entertainment One (eOne) in North America and Canada and Another Century overseas. The new release will be the band's followup to Hail The Apocalypse, released in 2014, which cracked the Billboard Top 200 for the first time in the band's career. The aim is set higher, further and deeper than ever before for AVATAR. Not only is this concept album their most extensive work to date, showing the widest range of any of their albums, it also contains a story too extensive for any booklet, so they made a book. A fully illustrated 60 page, 109 verse poem hardcover book. The physical album pre order, book, and exclusive merchandise will be available directly from the band March 17th. Click HERE to preview. The band is releasing their first song off the record in a very familiar way, a music video. Directed by longtime collaborator and director Johan Carlén, the video pegs itself firmly into the upper echelon of stunning visual masterpieces the band has grown accustomed to producing. Check out the video "For The Swarm" on KNAC.COM right HERE. With past works being buzzworthy videos like "Bloody Angel", "Hail The Apocalypse" and the 2015 Loudwire "Best Rock video of the year" video for "Vultures Fly", AVATAR continues to raise the bar for what bands are doing visually in the current state of hard rock and metal. "For The Swarm" is also available as an iTunes instant gratification track, meaning fans who pre order the album today will get the track as an instant download. The music is as always, rooted in the extreme, with plenty of melodic sensibility and a lust for experimentation. There is a love for intense double bass drumming, riffing and shredding of timeless dimensions alongside rough edges, slow grooves and epic storytelling for the ages. The idea is that as the band digs deeper, the fists will be held up higher. The end result is a modern metal album with all the ruthlessness and power one could ask for handled with a loving songwriter’s hand, inspired by THE BEATLES and QUEEN. AVATAR have developed quite the reputation for touring the US harder than even some of their American counterparts. Most notably, the band has grown well known for their epic performances in the US festival market. After their memorable performance at Rock On The Range 2014, a first for the band, it shows no signs of stopping. AVATAR will return to Rock On The Range, Welcome To Rockville, Carolina Rebellion, Rocklahoma and River City Rockfest in 2016. They will also be performing at Download UK this summer. Pre-order the album Digitally HERE.